I was asked, by two of my dear friends who are to wed this year, if I could make their wedding invitations. Oh man! This is an area I haven’t touched until recently. I met with the Bride & Groom-to-be and they brought me a pic from a wedding magazine and asked me if I could re-create the card they loved. Looking at the sample and seeing that it resembled the flowers from SU! Artfully Asian set, I said, “yes”. I wrote up a contract, explained the “Angel Policy”, gathered up all supplies I would need, and got started. This meeting is what made me fall in love with the color combo of Vanilla, Navy, and Turquoise:) It’s hot I tell ya! Lid removed from box to reveal shimmery white vellum. 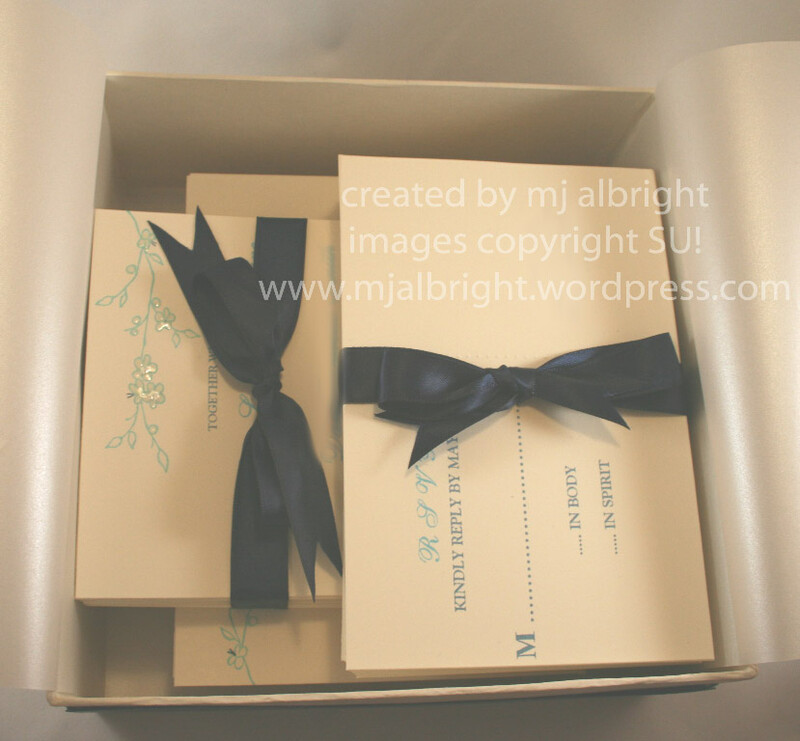 Here is the presentation of the invite package once the vellum is lifted up. 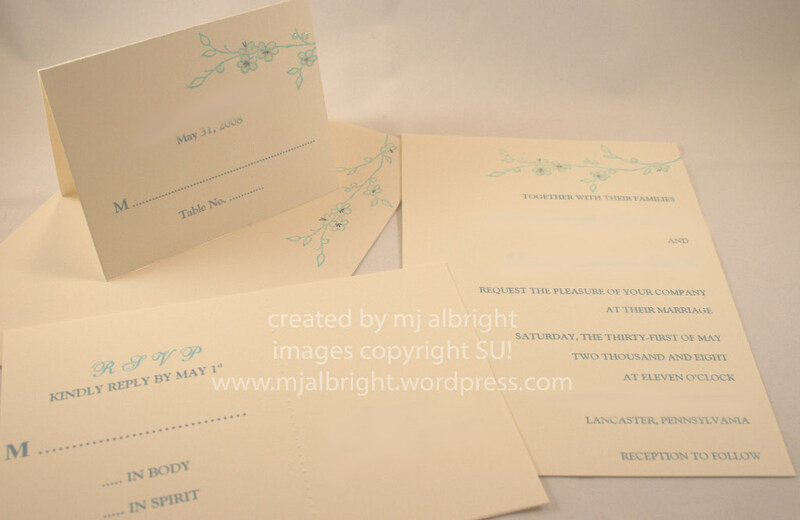 The package includes the invites, rsvp postcards, envelopes, and place cards for seating. It is rather hard to see details, but all flowers have Crystal Effects to them. 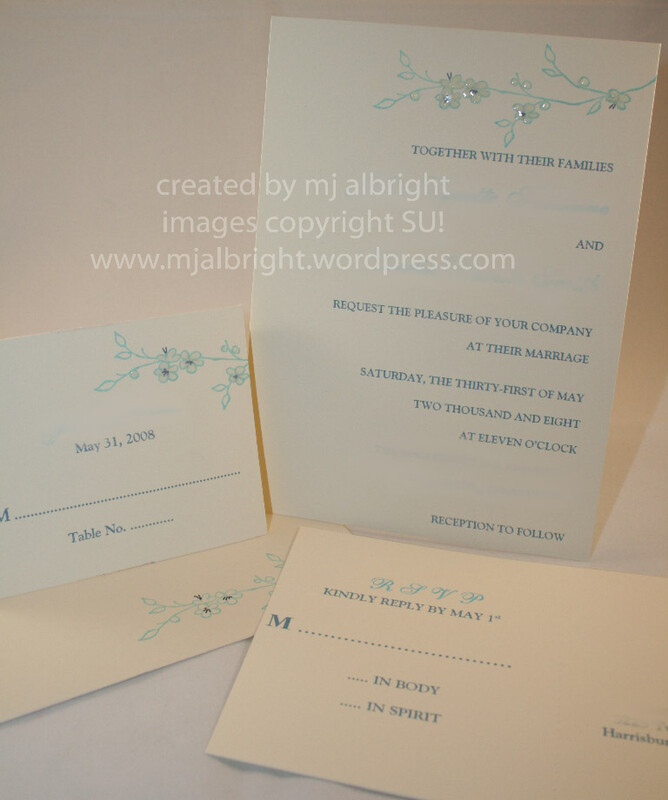 There are little dry embossed circles to the rsvp card to separate the response section from the return address section. I will be making a gift for them that I will post once I finish it (well, have to start it…lol). I want to make them something to showcase their invite. It will be framed and elegantly decorated to coordinate with their theme. You all know the fantabulous Taylor Vanbruggen right? This is another woman I had the honor of meeting out at CHA in February. Not only is she an amazing artist….girl should be a model. The froggies are so cute. Also, showing how you can combine two totally different companies & styles in one card. 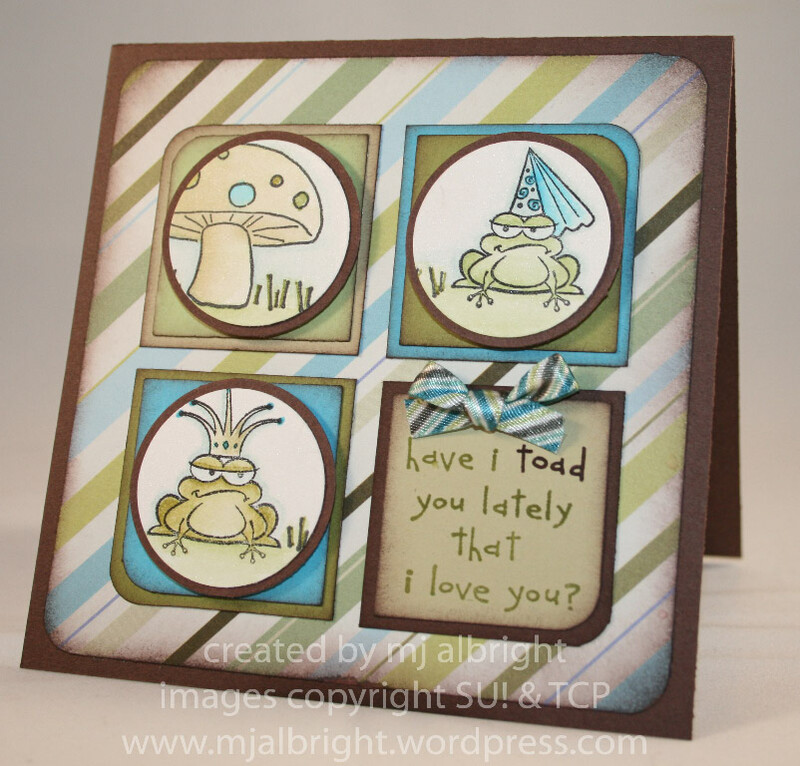 The sentiment and mushroom image are SU! Unfrogettable set. The two frogs are from The Cat’s Pajamas Loving Mew & Puppy Love sets. 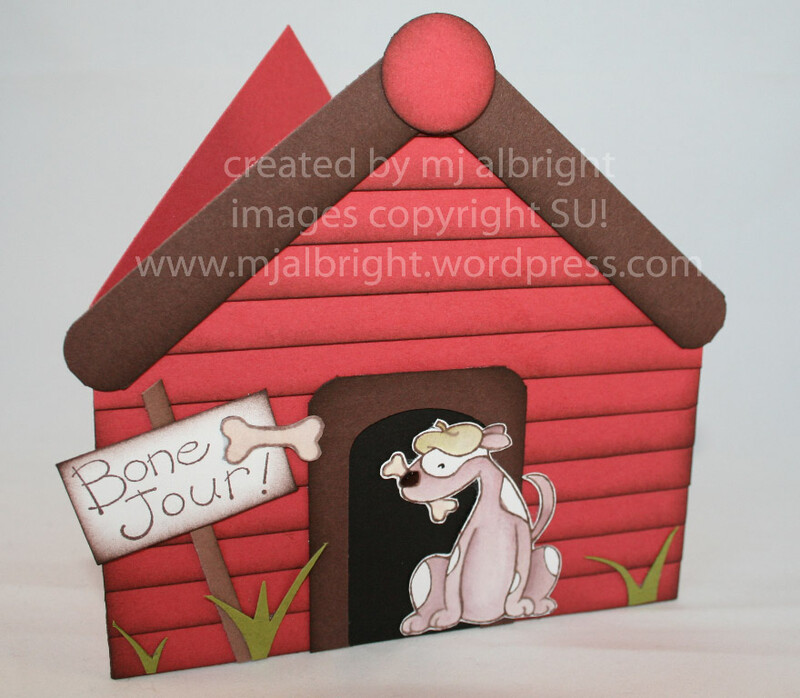 CARDSTOCK USED: SU! Chocolate Chip, River Rock, Tempting Turquoise, Old Olive, Certainly Celery, Shimmery White. PP from k-i memories “my guy funky stripe”. INKS USED: Stazon Jet Black Pad; SU! same as CS above plus Soft Sky pad; SU! markers Old Olive and Chocolate Chip. ACCESSORIES: Sponge, 1-3/8″ & 1-1/4″ Circle Punches, 1-3/8″ Square Punch, 3/16″ Corner Rounder Punch, Ribbon — American Crafts Elements Oxford #88381. (long story) Living with a BEAST…..
isn’t always easy. There are many responsibilities as a pet owner….one being that no one gets hurt. Let me set the scene for you. So, this woman walking her dog is one of those good pet owners who walks her dog 3 times a day and works on obedience training with her dog. She rescued her dog when it was young from an abusive environment so her dog has issues as well with other dogs. Now, picture it….my dog goes running towards her and her dog out front of my home. They start growling and fighting. We were both screaming. 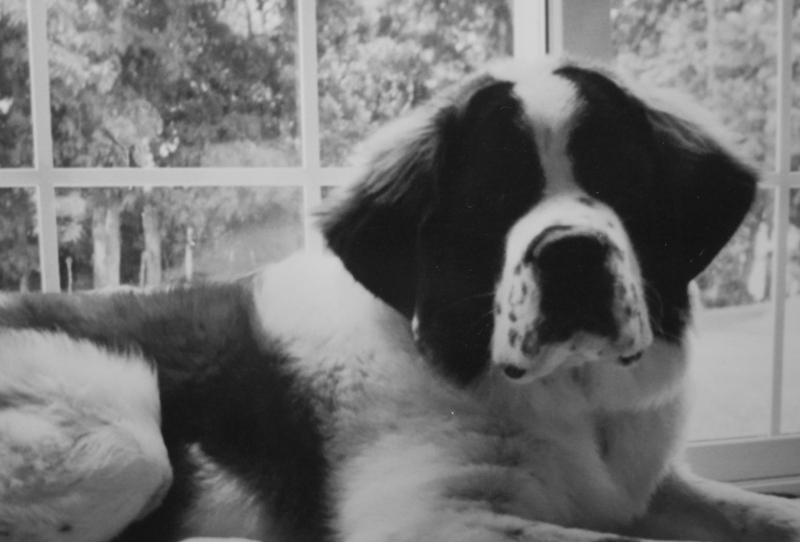 I was able to grab my dogs leash and pull them apart (I was afraid to go near her dog being it looks like a Pitt Bull and I have issues with them for some reason….now, this woman will have issues with Saint Bernards and I totally understand). She was very stand-offish and just walked away from me. I looked down at my dog and he had blood on his mouth and face. Great! I put the dog in the house and jump in my car to go talk to the woman. I was so upset and apologized like you wouldn’t believe. I wanted to make sure her dog was okay, explain what had happened, and inform her that my dog is up on all his shots and such. She was so nice to me and asked how my dog was. I get back home to check out my dog and the blood wasn’t from the other dog (which I first thought). My dog was the one who was injured with 4 punctures to his face. He limped around for 2 days. He is 100% better but still continues to have his issues with other animals. I waited to see if I would be contacted from someone or how ever that process works if someone reports an incident and I didn’t get a phone call or letter. What I did receive was a very nice “Thank You” card in my mail box for showing concern and apologizing. She went on to explain the history of her dog and she wanted to make sure my dog was okay. HOW SWEET RIGHT? I was so relieved and this will be an isolated incident. We have had our dog for 5 years and this has never happened. The first set features a SU! 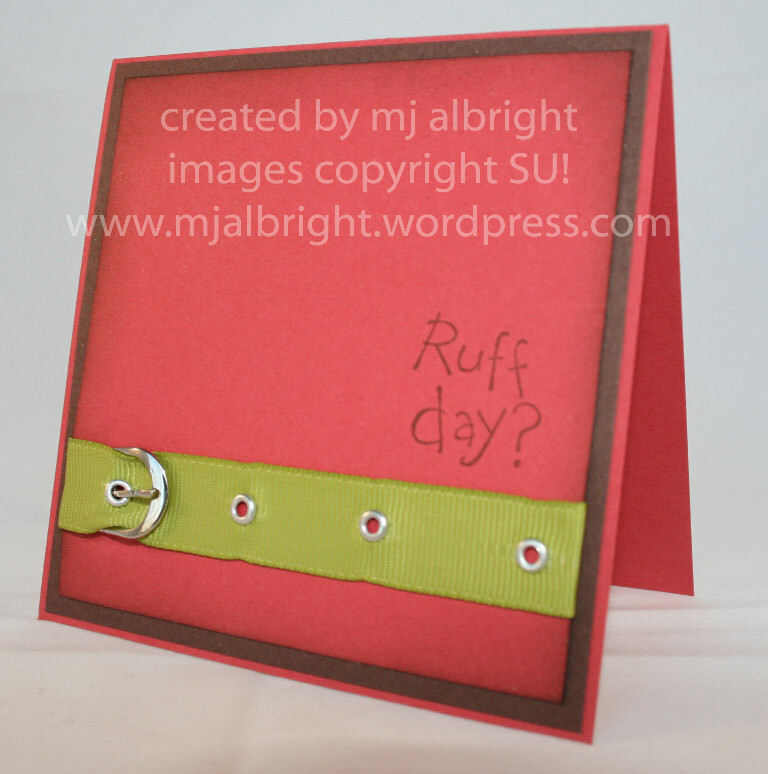 retired stamp set “Ruff Day” that I had to use cause it was one of my favorites and appropriate to use. Cause I know some will ask….this fire hydrant card I cased from the most talented Lauren Meader. She has a tutorial on her blog that you can view here. 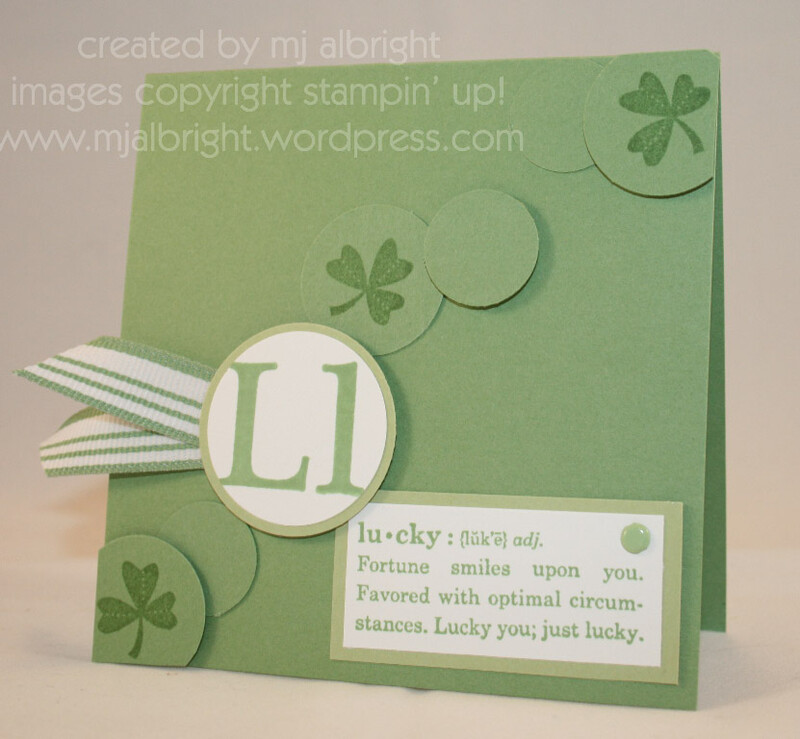 The only thing I changed from her tutorial is I didn’t have any oval stamps so I used Word Window Punch. Simple but didn’t want to take away from the dog collar I created with Silver Brads, 5/8″ Old Olive Grosgrain ribbon and I forget where I purchased the clasp/buckle. 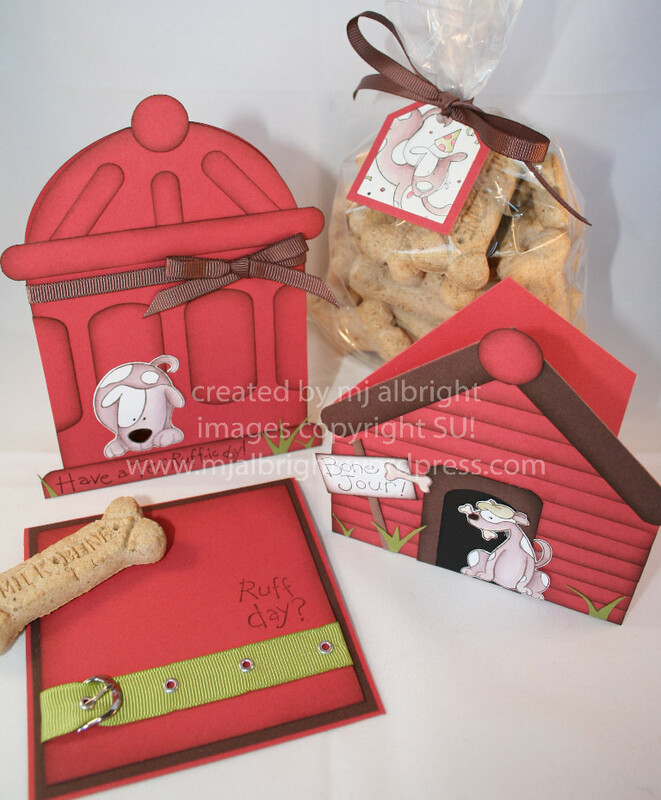 Now, since she always walks her dog, I thought I would also create 3 of each of the following cards (6 total) with envelopes and different sentiments so she would have cards handy to send out to people. 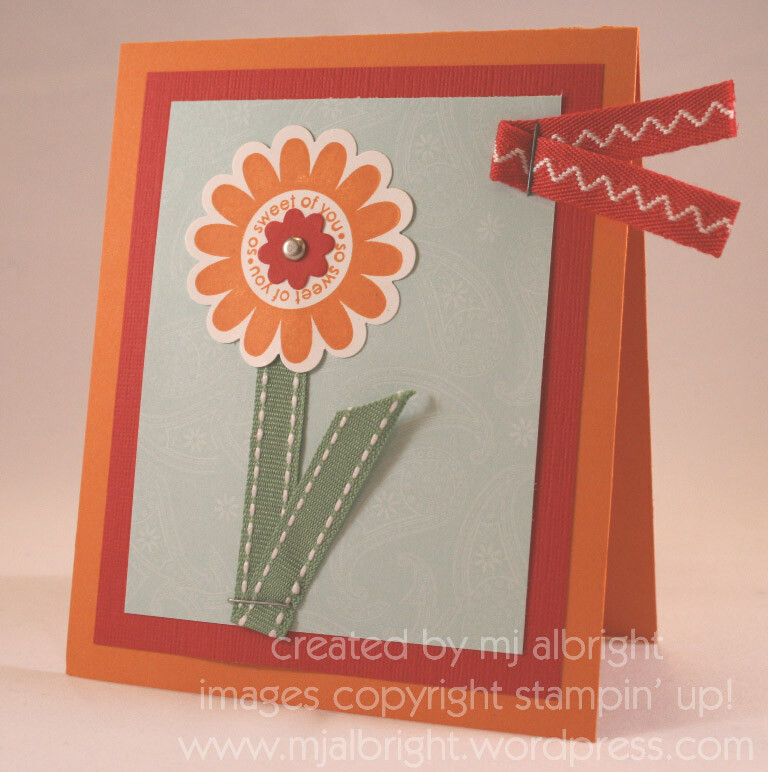 I love this Stamping Bella image. What pet owner wouldn’t? It is called Dogwalkabella with “need a hug” sentiment. 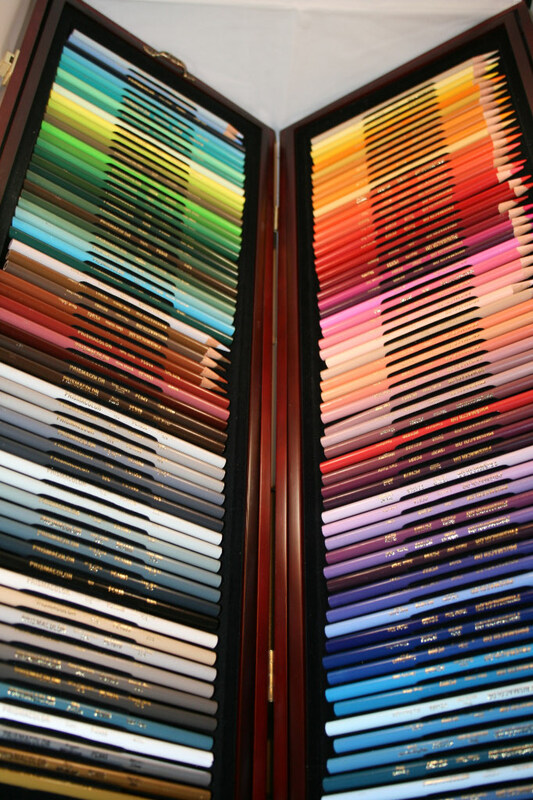 Paper is American Crafts “sixth avenue gramercy park”. The Light Yellow card base and envelopes coordinate and are from Gartner Studios which I purchased at my local craft store. 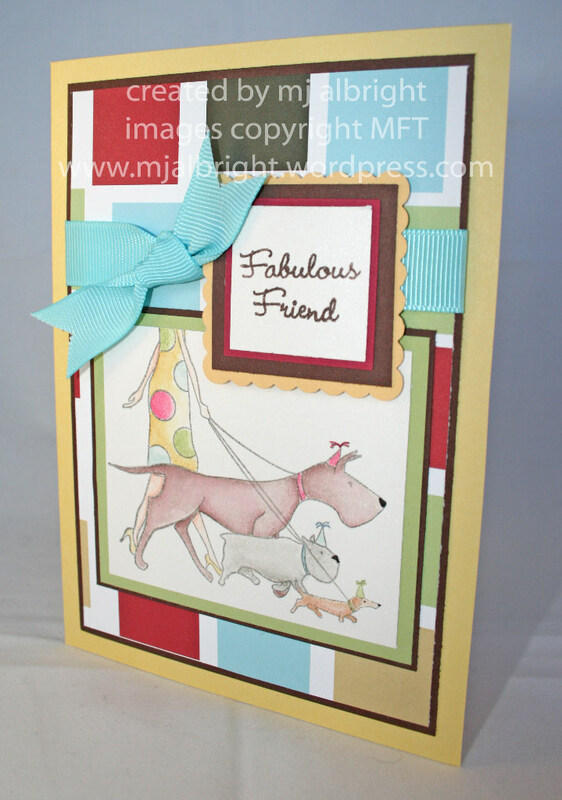 I used MFT set Let’s go for a walk for this card. Same line of paper (can’t find on the amer crafts website..must be older). So, I know the gesture will be well received. She does continue to walk her dog by our home. We wave and all is good:) Oh the life of a pet owner. Ahhhh, how about a way to showcase your work that doesn’t always involve card making. Doesn’t that sound good. 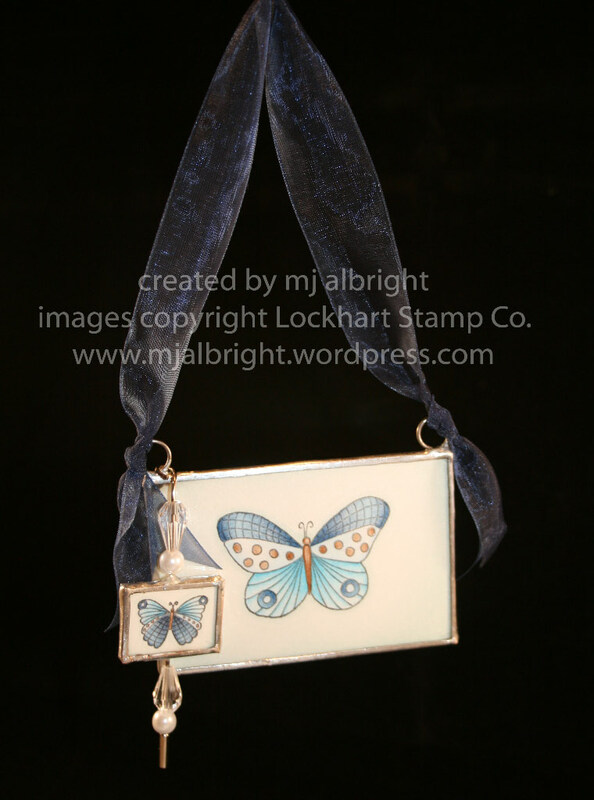 Think….ornaments, hangings, and home decor. Let me give a basic intro to Soldering. I was honored to spend a day browsing CHA with the most fabulous Ellen Hutson. I know right. I was trying to take it all in. Yep, I’m a nerd with a tablet taking notes from her….lol. What can I say. I try to remember ALMOST everything someone says to me. Well, during that day, I was introduced to soldering and was impressed by the possibilities and how I could showcase my work in a different light. Isn’t this amazing? Picture this hanging on a window,the wall, or a door handle. See, my Mom will receive so much more than a card this year. You will get everything in this kit to get started right away. 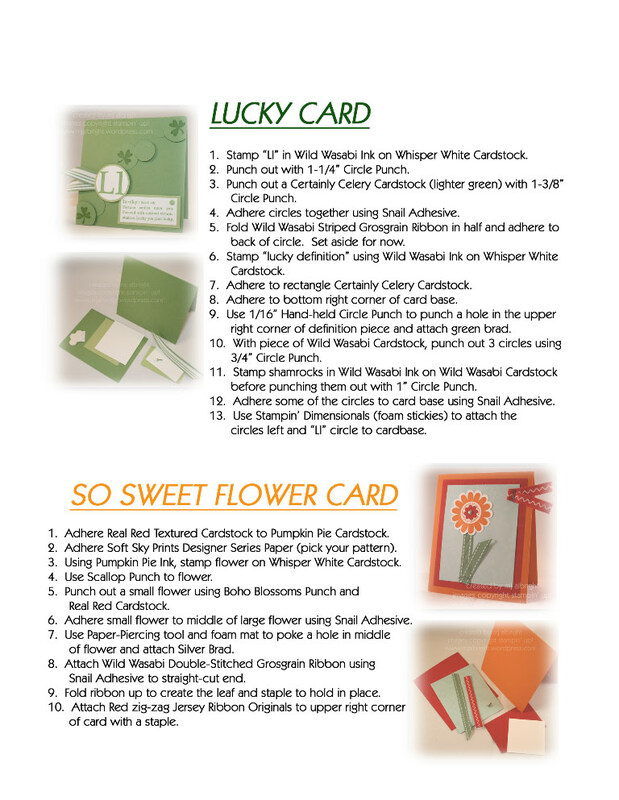 There is a tri-fold pamphlet inside with directions and step-by-step pictures. 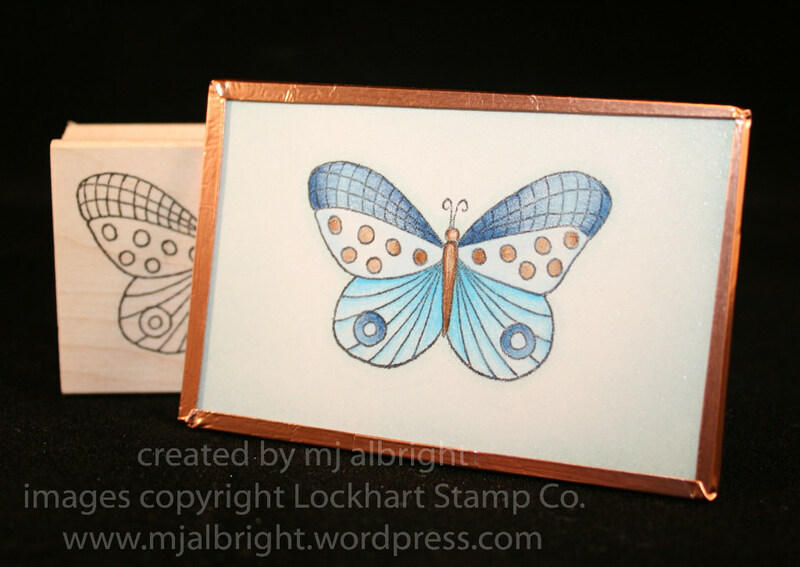 Color your stamped image and cover with pieces of glass. 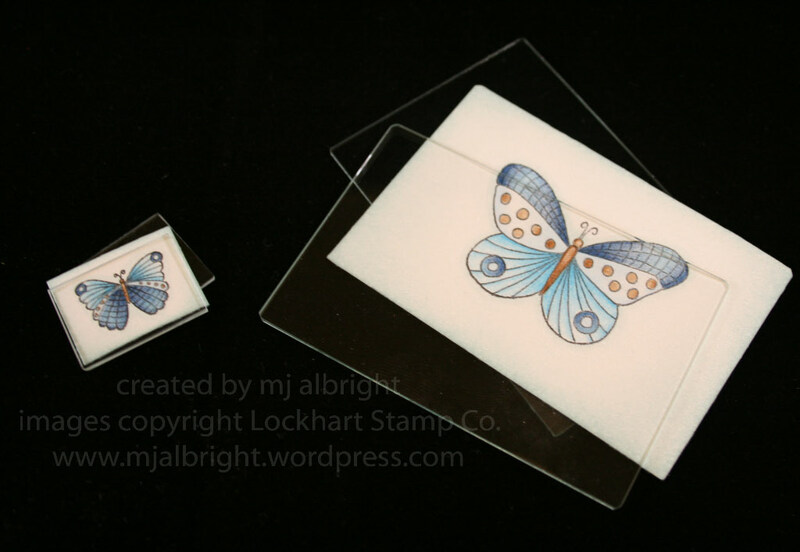 Images Checkered Butterfly & IB Butterfly are from Lockhart Stamp Co. purchased at Ellen Hutson’s webstore. I used Prismacolor pencils (Non-Photo Blue, Sky Blue Light, Indigo Blue, Chocolate, Cream, and White). I sponged the edges of the CS with SU! Soft Sky ink. Wrap Copper Foiling around the outside of the glass. The foil does have adhesive on the reverse side. You will want to fold in the sides of the foil. I started with the side pieces being careful at the corners so that when I folded down the top and bottom there were no rough edges or bumps. You want to smooth it out and rid all the air bubbles. Here is a pic of the sides folded in so you can see the corners. 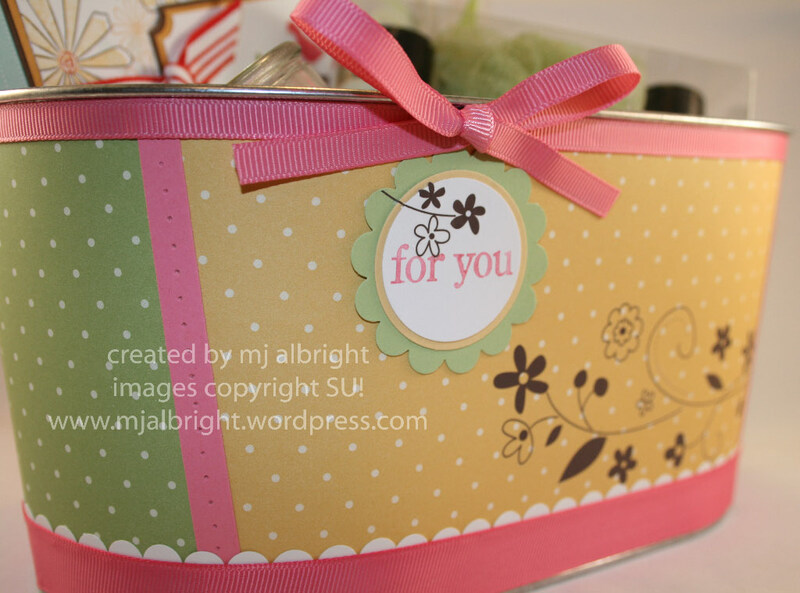 Use an Exacto Knife to trim the foil. It is really easy to cut and peels right off. You will next want to place your project in the holding clamps that come with the kit. You do one side at a time. Apply “Flux” to the side you are working with. Use soldering iron and solder to the side. I didn’t apply that much since this is still new to me. You will then repeat to all sides. Here is a pic of the first side I did (top). I started with the top and worked my way around. 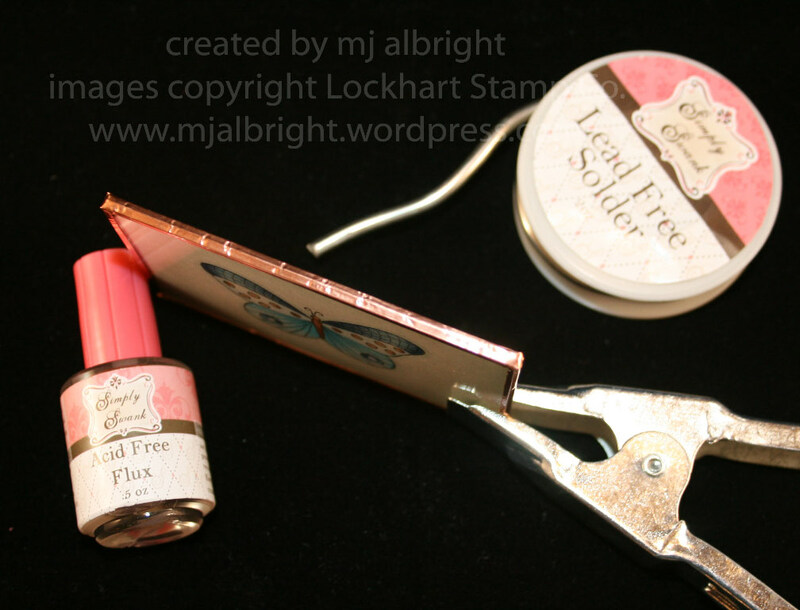 Once you are finished soldering all sides, file any rough areas with a file. The reverse side is a buffing file to finish the project. In my sample above, there are jump-rings. Well, I can’t take pics of that process. This step takes practice and is the only area I had some trouble with. I think it is because I’m a perfectionist and was trying so hard to form a nice mound of solder. I did finally get two jump-rings to the top of my project which I threaded Navy Organdy ribbon through. 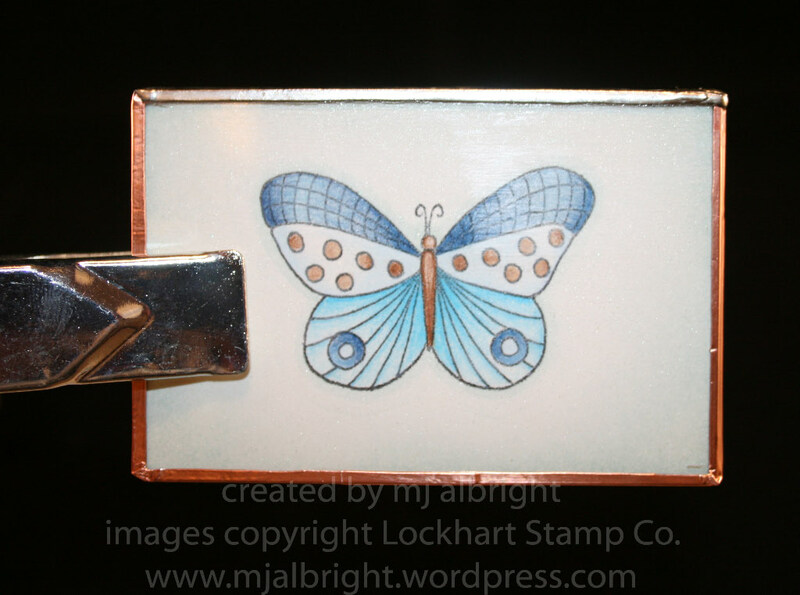 The little soldered image was so fun to make. I used my SU! Pretties Kit and soldered one of the pins to the back of it. LOVE IT!!!! Please, don’t do this with kids around. I waited until my kiddos went to bed just so there wouldn’t be any accidents. My little Ethan is always around me when I’m making projects and he grabs stuff and runs from me. This is not a tool I will be using with him around. Be careful with the copper foil when you trim it or little shavings will get into your skin….nothing serious. Make sure your work space is free from clutter. I used a cutting board to work over just for any solder that may drip. 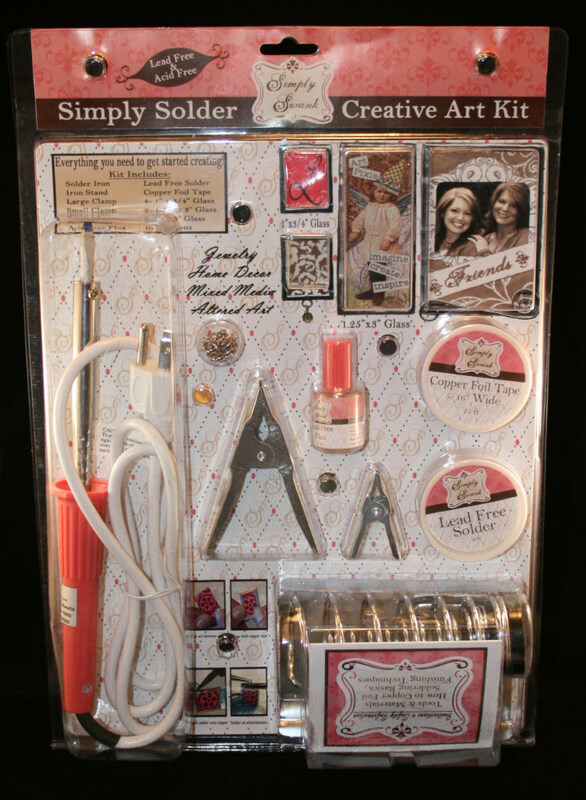 The kit does come with a soldering iron stand/holder. Like mentioned above, practice with the jump-rings is something I will indeed work on. Can’t stay away from watercoloring for long….I just received all the Ranger Re-inkers to play around with. That will be tomorrow. I keep telling my husband that “I NEED” these necessities to grow…lol But, it’s true! First, I must say thanks for all of your comments over the past two days. I read every comment and think I have replied to all of them:) Such a supportive group of people visiting me. Second, I am so glad it is Friday. I don’t have to work this weekend so I am really excited to be home. I’m getting the urge to do some spring cleaning and have a list compiled for hubby to help out some. I’m sure we will probably decide to postpone the tasks and just have some family fun. Hershey Park opens to Season Pass holders and I would really love to take the kids. Or, should I just stamp. See, told ya I’m so excited to be home. I love this weekends sketch. 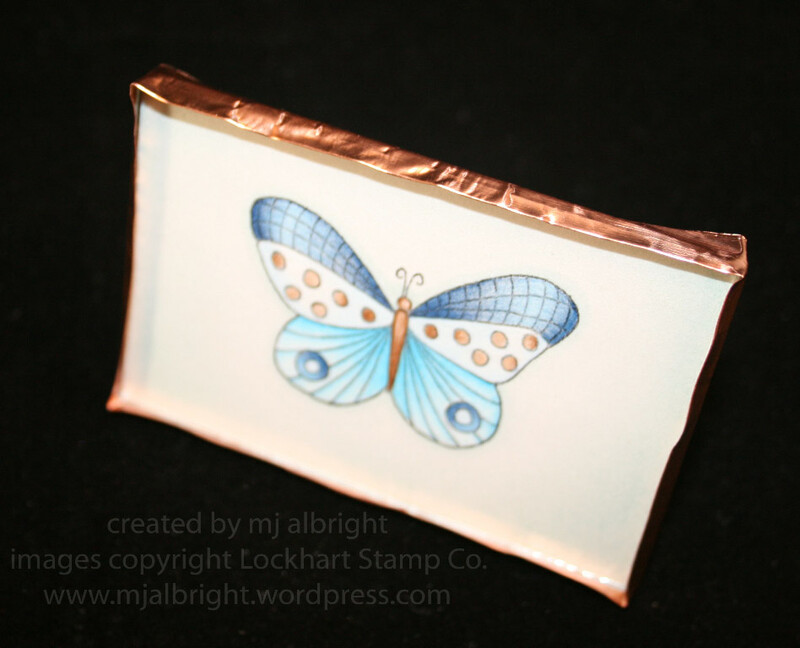 You can check out the details on Beate’s blog if you would like to participate. Ignore that eraser mark to the left of the image (oops moments do happen). 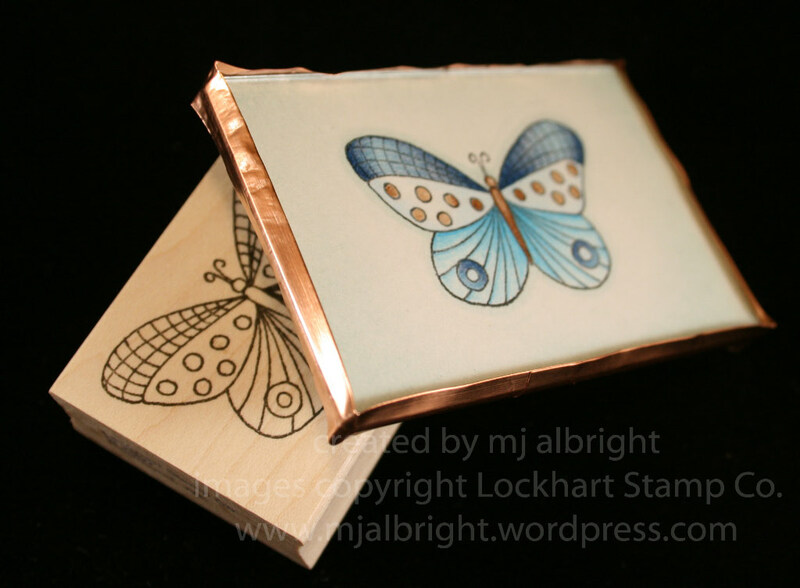 I had the honor of meeting Emily Block (Presidentabella) of Stamping Bella while at CHA this past February. She is an amazing woman. So is Nicky. I think I could have carried on a conversation with them forever. Truly amazing!…and so are the images. When I saw the above image, new friends ella and looloo, I had to have it. And, such the perfect sentiment for the set, need a hug? This is a card I will stash away and give to my daughter when she needs a little “pick me up”. The card base is Going Gray CS 4-1/4″ square. The patterned paper is SU! Bali Breeze DSP. The lock charm I can’t remember which craft store I purchased it at…I have had it for some time. I used Vintage Brads to coordinate with the lock. I added Cotton Candy Stickles to the crowns, dress sleeves, and necklace on ella. Ribbon used is Basic Gray Taffeta Ribbon. Okay, I can breathe a sigh of relief because I can officially state, “I mailed in my entries for the 2008 Artisan Award”. Let me share with you what I can…..the stats: over 100 hours of work, took 2.5 months of creating (I’m not a last minute rush person who likes pressure), I like to believe it is the best work I have done to date, 3 hours of sleep a night, $46.00 in postage, over $700 for product. Now, I shall shhhhhhh up and leave it in the hands of Stampin’ Up! 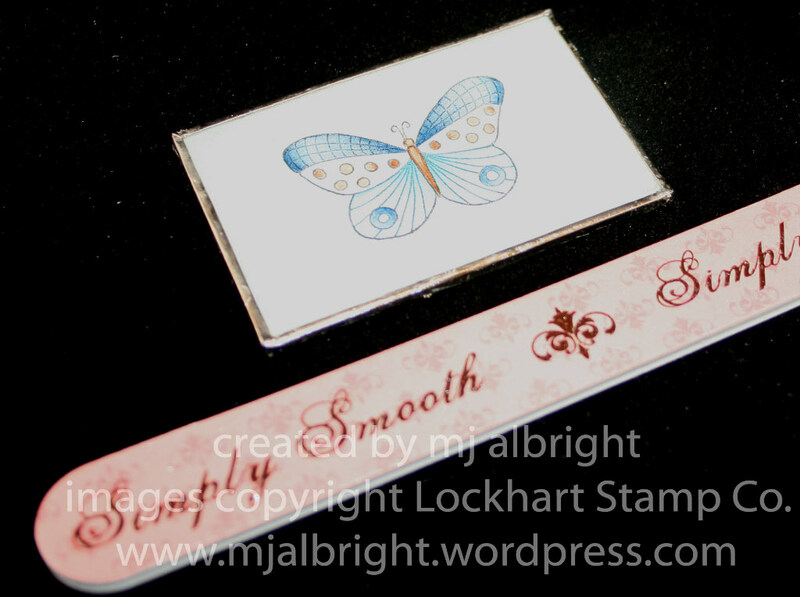 You may ask is it worth it, and I have seen mixed comments regarding submitting artwork to Stampin’ Up! I don’t know if I can explain the feeling, but when you see your work displayed in an environment with people who share the same love for something, it is truly amazing. To see the pages of my children last year hanging up so far away from my home, it is amazing and moving emotionally. Now, I can get back to blogging and share some things. I did do a workshop this month and it went really well. There were 19 people who attended and it was a blast with a St. Patty’s theme. I wanted to make “wow” cards that I consider easy. So simple and you get to play with all the different punches. 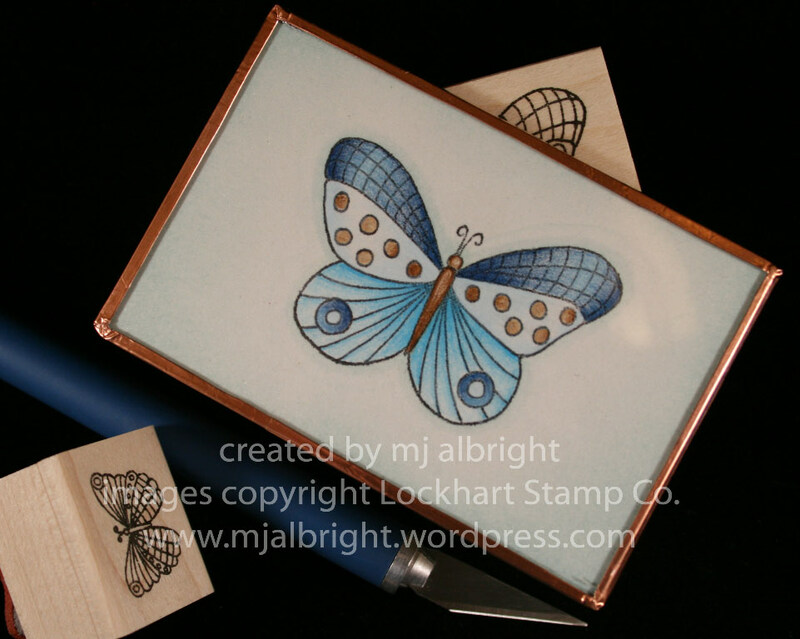 Showcases some of the more pricey stamp sets….but with these three sets (Holiday Blitz, Defining Alphabet, and Define Your Life), you can pretty much make a card for any occassion. Card #2 is even easier. I used a SAB set and showcased how ribbon can add so much to a card. Yep, I did realize the top ribbon retired, but I wasn’t changing a thing once I finished. It is a metal planter that you can purchase at any local craft store. I covered with DSP and added all the details. Everything inside coordinates except for the card I made her days prior to making the gift. There is a flower on a wooden rod that is cut out of the pic. It basically was made with Stitched Exotics and coordinated with the theme of the gift. It’s Friday and that means it is time for another one of Beate’s wsc. Wow! #40 for her sketches. I started participating in her challenges back when it was at #5 (somewhere around there), and have added to my personal card collection tremendously. These challenges have been very motivating so I hope you give it a try. This weeks sketch is quick and fun. 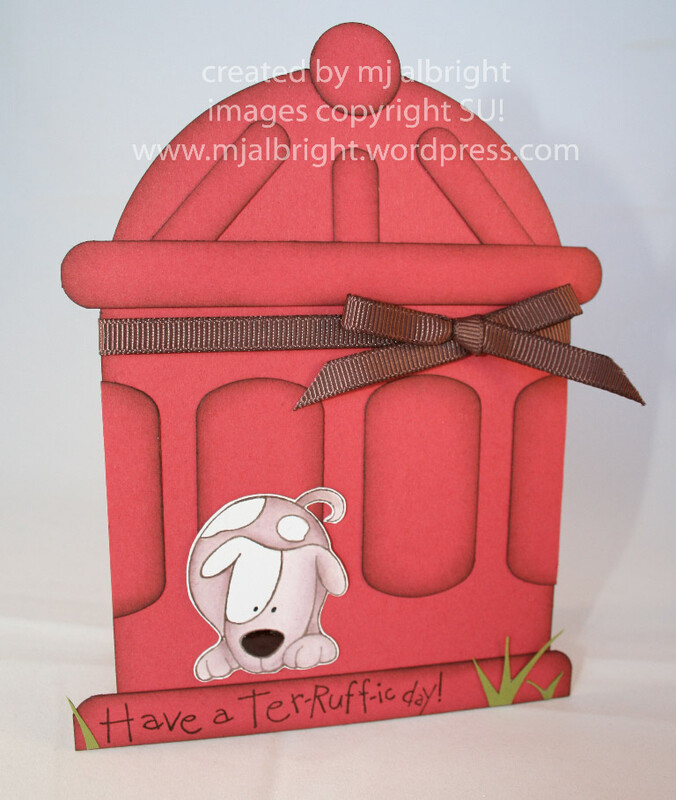 How about some MFT this week showcasing chocolate to get you all in the mood for a yummy Easter this weekend:) I used MFT set “How Sweet It Is” for my sketch sample. Happy Easter everyone and enjoy your weekend! INKS USED: Adirondack Espresso; SU! Chocolate Chip, Pretty in Pink, Regal Rose, Certainly Celery, Blush Blossom. 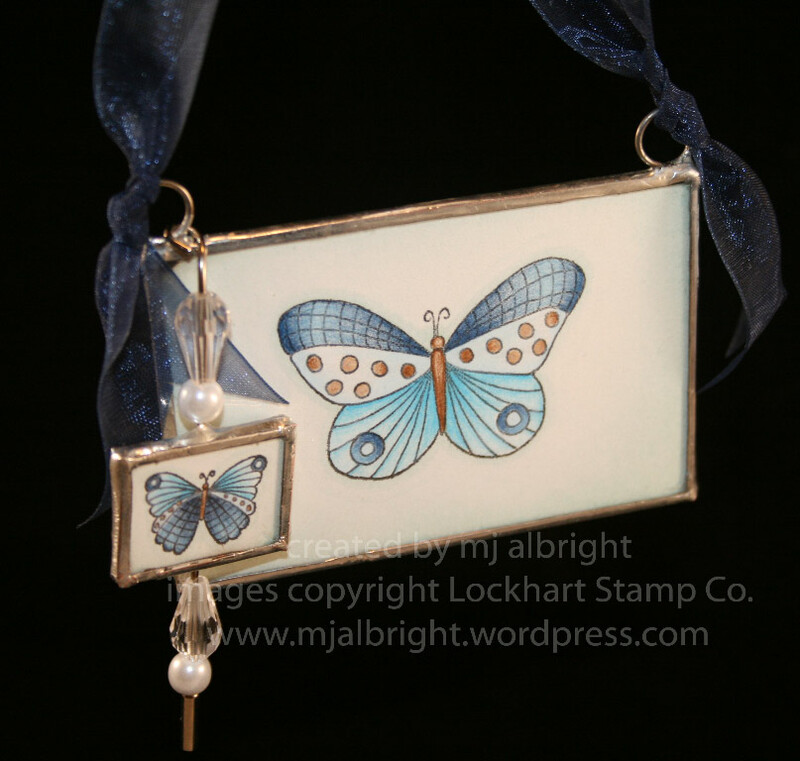 ACCESSORIES: May Arts ribbon; SU! 1-1/4″ & 1-3/8″ Circle Punches, Scallop Punch, 3/16″ Corner Rounder Punch, Aqua-Painter, Sponge, and Crystal Effects to chocolates.